Provence is without doubt a spectacularly beautiful region of France speckled with myriad vineyards. Yet, as regional French specialists, we have always struggled to discover captivating terroir-driven wines outside the remarkablea cru enclave of Bandol. Rosé, of course, is a Provençale speciality, but the whites have tended to be flabby and lacking in energy, whilst the reds, we’ve assayed, have usually been clunky and overextracted. There are always exceptions. 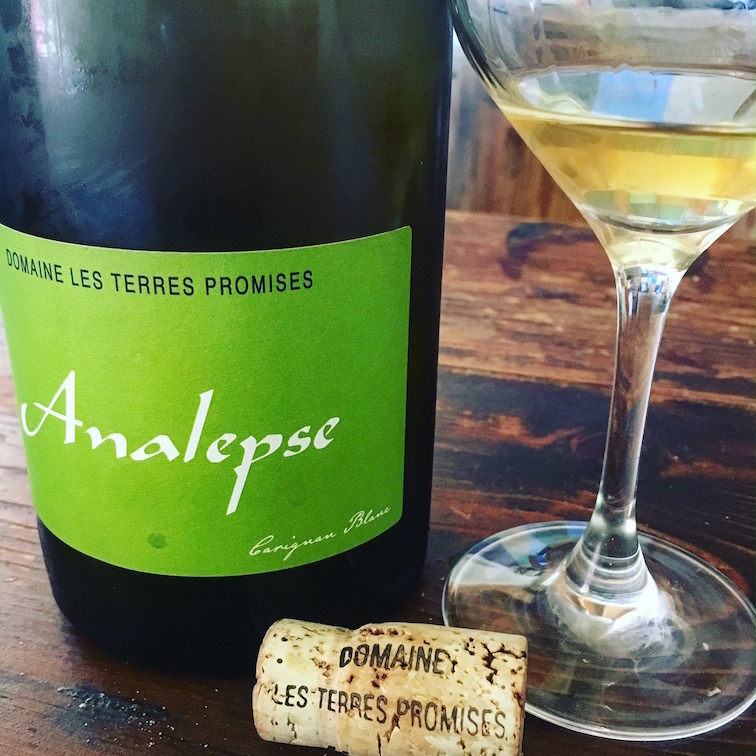 Guest blogger, Christina Rasmussen, has just returned from Les Terres Promises (The Promised Land) in the back of the back country of the Var, where she met the charismatic Jean-Chistophe Comor, a vigneron who does things somewhat differently. I adore Provence rosé; it is one of my staple wines and will continue to be. The reliable crisp palate of fresh fruits means it is a wine I return to over and over. However, it was fascinating and very refreshing to meet a man exploring different directions with local grape varieties. The wines were marked by some of the cleanest, purest expressions of origin that I have ever tried. I only wish I could take all of them home in my suitcase! Particularly noteworthy were a Carignan Blanc, a malolactic rosé and a beautifully soft Bandol Mourvèdre. 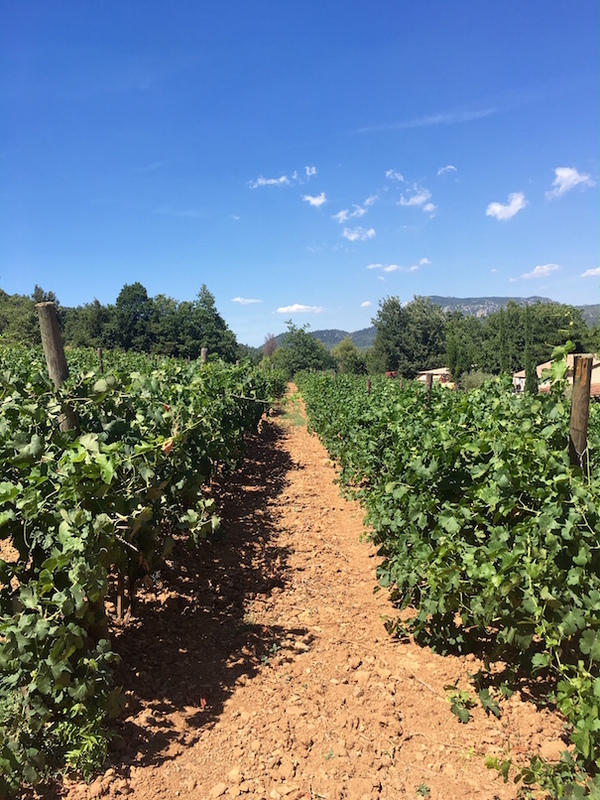 I arrived at the an idyllic and very secluded domaine via the windy, dusty roads of back country Provence on a scorching hot day with the sort of stifling silence that heat brings with it. Jean-Christophe met me and took me to see his new cellar, a thing of beauty made entirely from local stones. He has preserved the original layout of the building to keep the old sheep barn’s “esprit”. 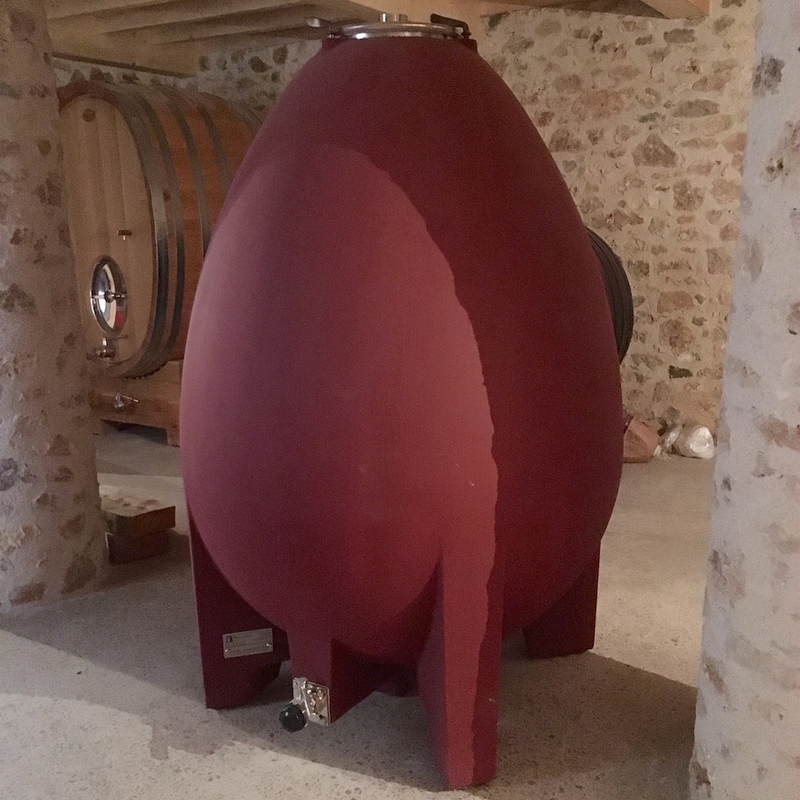 He has acquired a new fermentation egg and is looking forward to experimenting with it this coming vintage for his Rolle (Vermentino). I can’t wait to try this. Rolle is a very interesting variety and so I can’t wait to see what Jean-Christophe creates. J-C also has demi muids and a tall Stockinger foudre which houses his Mourvèdre wines. Before starting his winery in 2004, Jean-Christophe worked in political circles in Paris, organising groups to create a new dynamic between the citizens and political elite. He wrote Zéro Politique, a book about the exclusion of real people from political decisions. Eventually, becoming disheartened, he left the big city and set up Les Terres Promises, converting it to organics. We wandered through his Rolle and Roussanne vines which looked very happy and healthy with plenty of foliage despite it being such a dry vintage. Here, the vines have the benefit of fairly rich clay-calcium soils which retain water and mineral nourishment during the hot summer months. 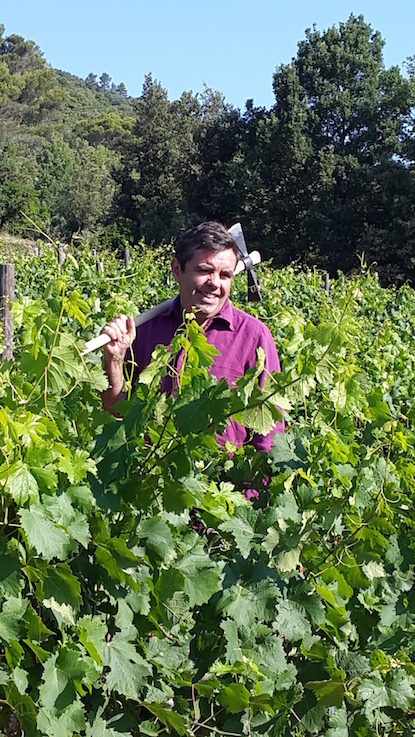 Jean-Christophe does not irrigate as it is important to allow the vines to reach deep into their soils to be able to attain the unique mineral “caillou” quality that his wines possess. This comes directly from the terroir. In one way, it’s like drinking a little piece of Mother Nature. Jean-Christophe was kind enough to let me taste all his wines with him. Jean has a wonderfully unique way of describing his varietals. He currently grows Grenache Noir, Carignan, Cinsault, Mourvèdre, Rolle, Roussanne, Clairette, Grenache Blanc and Syrah. He is one of only seven growers in the whole of France producing Carignan Blanc. All wines are made using indigenous yeasts. Carignan Blanc is an ancient variety, hence the flashback. A fascinating wine with 14 days skin contact, aged in demi muids it harks back to traditional winemaking. With a mere 3000 bottles made this is one of the most impressive and unique whites I have ever tasted. Powerful nose of orange peel and citrus accompanied by spicy notes and a bit of rosemary garrigue. It is beautifully supple in the mouth, showing notes of fresh peach with a very long spicy finish. Floral, very fresh nose of blossom and wild flowers with rich raspberry and honeyed peach notes. On the palate, the fruits continue to shine through and the zingy minerality appears: the characteristic of the limestone soils in which these vines grow. 100% Cinsault. From 40 year old vines, with very low yield of 20hl/ha. A wonderfully delicate perfumed, floral nose of strawberries, cherries and lavender. Slightly denser, earthy notes appear on the palate. Such finesse and a wonderful example of pure Cinsault. Old Carignan vines with Mourvèdre. Here, the Carignan brings a seriously concentrated chewy fruit-forward palate with notes of red and black fruit, with an added spicy edge from the Mourvèdre. It’s a bold, full, round wine. The old Carignan is produced with carbonic maceration, hence this lovely juicy fruit. “When we are young we like to go “au hasard et souvent” – often exploring all sorts of things at random. However, when we then grow up we are “autrement et encore” – we will do things differently and start to “preciser” – explain/refine/clarify. That difference is mirrored in these two very different styles of wine: the Au Hasard et Souvent is bolder and more rustic, whereas the Autrement et Encore is more refined. After a word created by Rimbaud meaning huge, ludicrous, complicated. In terms of this wine, it’s a big, rustic and wild with animal notes. Mourvèdre and Carignan from 30-year-old vines and yields of 30ho/ha. The Mourvèdre is not from Bandol but from the vineyards right next to this house. Jean-Christophe said, “Carignan and Mourvèdre – they’re the two most macho grapes but you can put them in white shirts and voilà! They’re easy to elevate when you understand them.” By which he means is that you must be gentle with them and not over extract. It’s important to find the balance of true terroir expression. They are aged in the large Austrian foudres for 12 months for this reason – to give good roundness and not too much oak flavour. Rich, dense notes of blackcurrant, spices and liquorice. Lovely animal nose with notes of leather and subtle smokiness in the mouth. Long finish with supple tannins that contribute to create lovely mouthfeel. A “voyage ailleurs”. Grenache and Syrah here. The berries are 100% destemmed in order to express the gentle purity of fruit. Lovely floral nose of roses and lavender. The garrigue really shines through here. In the mouth, notes of bright cherries and blackcurrants shine through with a herbal edge. Lovely and fresh. A serious wine. Fresh with a lovely delicate length with herby, spicy aromas on the nose. In the mouth it develops to fresh black cherries, and even a hint of raspberry, with cinnamon and nutmeg on the finish. Thank you so much Jean-Christophe – I’ll be back!